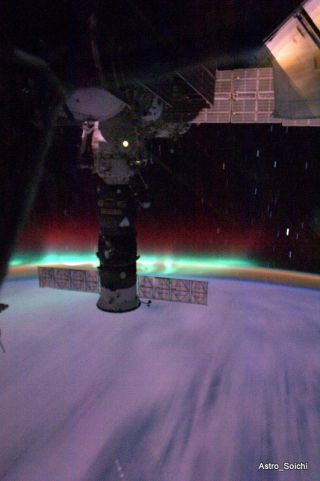 The International Space Station flies through Earth's aurora in this photo taken by Japanese astronaut Soichi Noguchi and posted on April 5, 2010. A Russian Soyuz spacecraft is visible docked to the station. Full story. An astronaut has captured the rare view of theInternational Space Station zooming through a dazzling display of Earth'saurora as the strongest geomagnetic storm of the year hit the planet. In the stunning space aurora photo, the InternationalSpace Station is seen flying 220 miles (354 km) over an Earth lit up by eeriegreen auroras peppered by red hues. A Russian Soyuz spacecraft is backlit bythe cosmic light show in the image. Japanese astronaut Soichi Noguchi took the stunning photoand posted it Monday on Twitter, where he has been chronicling his six-monthmission to the space station under the name Astro_Soichi [moreaurora photos]. "Fly through Aurora at 28,000 km/h," Noguchiwrote, cheering his 1,000th tweet. The International Space Station orbits theEarth at about 17,500 mph (28,163 kph). According to Spaceweather.com, Noguchi's aurora snapshotcoincided with a strong gust of solar wind that hit the Earth'smagnetosphere on Monday, creating the most powerful geomagnetic storm of theyear. The storm is subsiding, but has been creating spectacularauroras for skywatchers in high-latitude regions, Spaceweather.com reported. Noguchi and his crewmates recently set a new spacephotography record for the most photos taken in a singlemission. He and his five crewmates at the International SpaceStation are about to get extremely busy. NASA's spaceshuttle Discovery will arrive at the station early Wednesdaywith a crew of seven astronauts, boosting the number of people aboard to 13people. The shuttle will deliver tons of supplies, spare partsand new science gear to the space station. It is one of NASA's final fourshuttle missions before the fleet is retired in the fall.